Neither. Went searching for info on Zebra 2 and found these few comments. Ironically though VCV 0.6 IS coming soon with DAW-integration. Also great software. So addictive. Does anybody know how I can assign user patches(in Reaktor) to a Program Change/Sub/Bank? I can’t, for the life of me, figure it out. Sorry, can only tell you that when it comes to assigning MIDI in any way with NI stuff, I have sometimes been driven to violent thoughts. Think I spent an hour once trying to assign a knob on a controller to something in Reaktor and had to give up. Changing the MIDI chanel to something other than 1 is tantamount to herding cats. Good luck on PCs. Report back if you figure it out. First you need to click on the ‘EDIT’ button on the menu bar. Then click on the ‘Properties’ tab (the box with the tick inside it). Next click on the ‘Functions’ tab, scroll down to snapshots and select ‘Recall by MIDI’. Program changes should work now. Think I spent an hour once trying to assign a knob on a controller to something in Reaktor and had to give up. I’ve successfully been able to go prog Christmas but only through factory presets. Any idea how to assign user patches to specific prog ch messages? 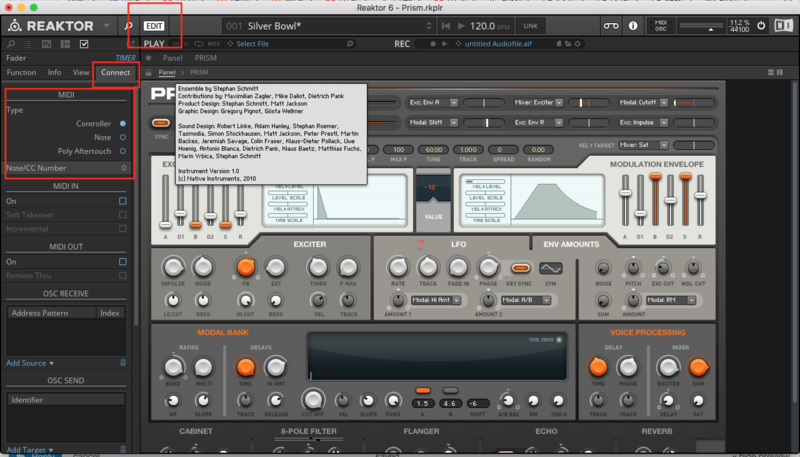 yeah, prog change messages change your snapshot on reaktor, snapshots are under the page highlighted below. if “001 best of” is highlighted the list of snapshots in that bank will be below it. prog change 1 will select silver bowl, PC2 will select lonely molecules and so on. if you want to build a list of patches click the user bank and when you press add at the bottom there it will take a snapshot of your current settings on the ensemble and add it to the list. Thank you very much for your detailed and descriptive answer! I look forward to investigating this when I get home! Thanks, man. I guess part of the problem was that I was trying to use it in Ableton, which just caused a whole mess of brainfarts. I would say that the implementation could be better, but I would also say that I can be really impatient and thick at times. Few years back I did some nice hacks (in my humble opinion), Reaktor drum machines, everything can be midi assigned, great for IDM, glitch, or whatever. Low on CPU, load samples, they are worth trying. What great timing! I’ve been really getting into Reaktor lately(Not building my own) been on a download hunt for more instruments! Good stuff! Will download soon! You’re welcome @Ryan, they may look simple, but there’s a lot going on in modulation and automation and sequencers. The sample banks are nearly empty, so you should fill them with quality samples of your choice. been on a download hunt for more instruments! I became instantly aroused listening to that. Thanks for the heads up! Looks like it’ll be fun! Ok. I get it now. 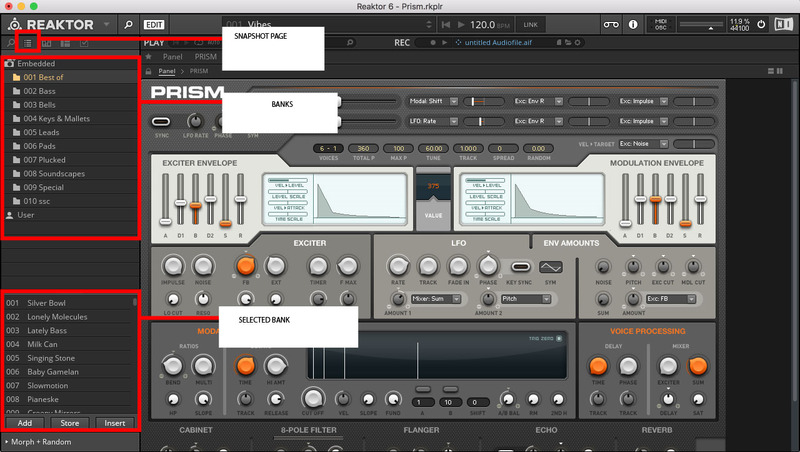 Reaktor’s really fun.